PROMOTE YOUR FRANCHISE (we can help)! At KD Kanopy, our goal is to help you promote whatever it is you need to people to know about. It might be your team, your brewery, your sorority, your local business or your franchise. Your brand has to stand out from the crowd. That’s how businesses grow, right? 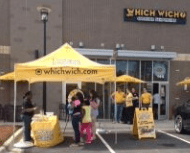 You have to be better than your competition, especially today when franchises, food franchises that is, account for 48% of the annual financial output of the U.S. franchise industry. That’s almost half! People have to eat and you need them to eat at your establishment. That’s where we come in. Let us help you stand out in the crowd. We have many types of products that will bring attention to your store. More attention equals more customers and more customers equals more revenue for your business. -We offer special franchise pricing! You won’t pay retail. -We have a variety of pre printed inventory that ships out same day. -Our products last. The materials we use to create our products are commercial grade in comparison to our competition. -Our canopy frames have been known to last 30 years! -We carry every replacement part you may need. -Our printing looks bright and crisp. -We add UV inhibitors so your canopy top won’t fade in the sun! Here are a few of our items that are sure to get your franchise noticed. 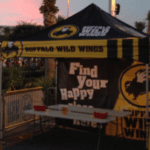 This canopy is perfect for your franchise because the set-up is easy, the frame is durable and it is our most cost effective option. The canopy top can be printed with your logo and your brand’s colors. We have 3 different printing options that are sure to fit your needs. 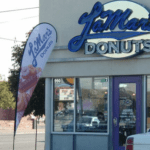 Catch the attention of people driving or walking by your establishment with one of our banners. With your choice of graphics printed to them, they become even more appealing. With our ground spikes, bases and mounts, they are easy to set-up and take down. There’s nothing better than branding all of your equipment, especially when you are at a trade show or out in your community. 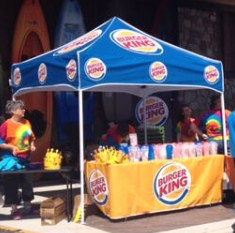 A fitted table cover will be the cherry on top of your promotional sundae. Choose from 4’, 6’, or 8’ sizes and we will print it to coordinate with your other items. Feel free to contact Clint, our Account Executive, for further information regarding products and special franchise pricing!